I do find the splitting of human beings in two apparently separate parts, body and mind, very odd. As I’ve said to patients, I’ve never met a mind without a body, and I’ve only met a body without a mind in the mortuary. Sure, it’s common for people think using a two-value system – right or wrong; good or bad; black or white – but it’s always a highly inaccurate way of describing reality. I’ve heard people wrangle over whether someone’s pain is in their body or their mind, and that seems a particularly peculiar question to me. In fact, I once I heard a health service worker describe a patient as “one of those people whose pain is all in their mind”. What did that mean? They were pretending to have pain? They were making it up? How do you experience pain without using your mind? Can we put the mind aside when considering pain? I guess what people mean when they talk this way is where is the source of the person’s pain? Is it a physical lesion? Or is it a mental one? I still don’t find that helpful. Surely we need to consider a person as a person, and a person with pain as a person with pain. Subdividing them isn’t helpful. But, here it is again, in today’s Independent newspaper, that extremely odd tendency to consider human beings in two separate parts. In an article by Jeremy Laurence about research showing Cognitive Behavioural Therapy can be effective in people with back pain….. Seriously, finding lesions which can be modified, repaired, or removed is one thing, but to consider a subjective phenomenon like pain as being divisible into physical or “in the mind”…….let’s move on. Far too many people with pain have had surgical operations to remove the claimed physical cause of their pain, only to find themselves with just as much pain as before. People with pain deserve to be understood as whole people, and to have care which is suitably holistic. Otherwise, the pain remains…..
Thomas Goetz’ new book, “The Decision Tree” looks interesting. His theory, based on research evidence, is that two behaviours significantly improve health outcomes – being personally involved in taking the decisions about your own health care, and sharing with others. A decision tree, essentially, is a flow chart – it’s a kind of algorithm, a way to factor in various strands of information and probabilities to move towards an optimal outcome. So it’s a way of thinking about our healthcare as a series of deliberate choices, where we are the primary decision-makers. When we take on that role, we tend to have better health. I like what he says about DNA – that it’s an indicator, not an inevitability. However, I wonder how people will cope with the knowledge of their DNA disease markers? Will they feel like they’ve got some ticking time bombs on board? And, he’s very balanced about screening programs, recognising that they are problematic, not least because of the false positives they throw up. He points out that giving people personal feedback on their behaviour changes and involving them in communities are two tried and tested techniques which can be delivered much more easily now with smartphones and online communities. One of the amazing things I learned in writing the book is that many popular drugs don’t really work all that well. Anti-depressants work at best around half the time; chemotherapies for cancer work at best 20% of the time. This is the hit and miss of modern pharmacology – there are no sure things. It’s amazing how that well-established fact is still ignored. As he’s an editor of Wired magazine, it’s no surprise that his hope lies in pharmacogenomics coming up with the ways to produce more targeted drugs. I’m pretty excited about the Health 2.0 ideas. Social networks and wikis are two potentially useful tools for patients, and I think Goetz’ book adds others – the decision tree itself and the emphasis on personalised feedback. Potentially, this is all about a shift in power, away from doctors and towards patients. In my opinion that’s a trend to be encouraged. In a new study just published in the European Heart Journal researchers have looked at the impact of a “positive affect” on the chances of getting heart disease. What’s “positive affect”? As always, the researchers strongly plead for more research, both to clarify if their findings are revealing something true, and to begin to develop methods for helping people to develop a more positive affect. Is it possible to increase your positive affect? Well, think about what makes you happy, excited, brings you joy. Think about how you experience moments of contentment. What are you enthusiastic about? How could you spend more time than you currently do following your passion? I wonder how this study connects to the well proven benefits of TM in reducing heart disease? I practice TM 20 minutes twice daily. That’s 40 minutes of contentment. I often think of myself as a “peripatetic enthuser” – I am passionate about life. The daily world excites me, fills me with wonder and amazement. I laugh a lot. Will this way of living reduce my chances of heart disease? I don’t know. Maybe it will, if this research is correct. But I don’t live this way to try and avoid diseases. I don’t live this way to try to avoid dying. I live this way because this is how I want to live. Here’s my personal view on avoiding heart disease. I hope I’ll never get it, but whether I do or not, I’d rather live enthusiastically, passionately and joyfully. If this way of living reduces my chances of heart disease, that’s a bonus. But what does this mean for health care? Our current focus on reducing premature deaths from heart disease, has got two strands – “lifestyle” changes eg not smoking, eating less and exercising more, and taking drugs – statins, or even, as some advocate, a whole mix of drugs in one pill. That whole thrust seems to be towards death avoidance, and it’s not a strategy I personally prefer. I’ve a real penchant for focusing on, and building up, the positive. A life well lived today, is a life well lived, irrespective of how long that life turns out to be. where is this washing line? Wow! Suddenly just another washing line, isn’t just another washing line after all! Tell me. How do you feel when you look at these photos? Here’s one of the most challenging and thought-provoking articles I’ve read for a long time. It’s by Sharon Begley and the title is “The Depressing News about Antidepressants”. A lot of people take antidepressants and the consumption is increasing. In the US it’s doubled in a decade (from 13.3 million in 1996 to 27 million in 2005). Most of these people say the antidepressants help them (about 3 out of every 4 people say that). However, researchers such as Irving Kirsch, of Hull University, have been looking closely at the evidence base to see how much of the benefit can be attributed to the drugs, and how much to the placebo effect. In 1998 they reviewed 38 trials (all of which were sponsored by the manufacturers of the drugs) and found that in the 3000 patients studied, those who received placebo demonstrated about 75% of the improvement experienced by those on the drugs. Now you might think that means the drugs were more effective than the placebo, and that’s true, but how much more effective? One of the mistakes people often make when reading clinical trials is to assume that in the two groups, the placebo group and those taking the drug, that the placebo effect only occurs in the placebo group. That’s not true, however. The placebo effect occurs in everyone and the results of those trials suggest that three quarters of the improvement experienced by those taking the antidepressants is due to the placebo effect, and only a quarter to the actual drug. The Newsweek article goes on to consider the issues of using increasingly high doses of antidepressants and switching from drug to another, but nothing shakes the conclusion that by far and away the greatest effect of antidepressants is from the placebo effect. The author also considers the serotonin story showing that lowering brain levels of serotonin appears to have no effect on mood which makes it hard to swallow the theory that SSRIs (Serotonin Selective Reuptake Inhibitors), the most modern form of antidepressant, like Prozac, relieve depression by altering serotonin levels. But wait! As Jonah Lehrer points out in his excellent post on this article, there is evidence that SSRIs might increase brain plasticity – in other words, maybe they make it easier for you to cope, so let’s not throw them away yet! So, here’s the first disturbing part of this article – antidepressants are, for most people, not any more beneficial than placebos. This dilemma is such a dilemma in part because the placebo response is so poorly understood, and, I believe mis-conceptualised (cripes! is there such a word?) In particular, many people make the erroneous assumption that a placebo is no better than doing nothing, and/or that it’s effects are only temporary, so not ultimately useful. Neither of these assumptions is justifiable. A benefit, or a harm, from a placebo, or nocebo, can be both powerful and long-lasting. 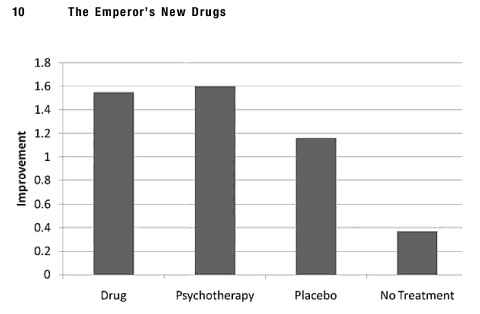 Kirsch has a new book out entitled “The Emperor’s New Drugs”. In the opening pages he includes this excellent graph. What the graph shows so clearly is not only that the drug effect is not that much greater than the placebo effect, but that the placebo effect is considerably greater than doing nothing. I think this is a key point which is commonly missed, and which we need to address. If you think the placebo effect is no better than doing nothing, you’ll argue that any treatment which is not significantly greater in its effect than the placebo effect should be withdrawn. But then what? What if everyone who is currently taking antidepressants stopped them because they are no better than placebo? The amount of mental distress and harm would probably go through the roof. Kirsch is at pains to specifically warn against this response in the front of his book. This is a complicated question. It’s not as simple as dividing treatments into those “which work” and those “which don’t work” on the basis of placebo controlled trials. Don’t we need to approach this problem from a different angle? Human beings are complex adaptive organisms. Complex adaptive organisms self-organise. That’s a fundamental characteristic of all complex adaptive systems. Self-organisation in human beings includes defence and repair. There is no way for anyone to heal other than through the effective functioning of our self-organisation, or to put it another way, we only become well through the effects of self-healing. It doesn’t matter whether someone receives a drug or a placebo, if they are genuinely healing, it’s self-healing that’s doing it – in both cases. Drugs, at best, are adjuvants to that process. They support the organism as it self-heals. The question then is what treatments support and promote self-healing? The second question is what potential harms can those treatments cause? A choice about treatment then involves balancing these two aspects – the potential for healing vs the potential for harm. As well as comparing treatment options this way, we then need to set this against what we’d expect might happen if we did nothing. I don’t think any of this is easy, and I certainly don’t think I’ve got it all worked out myself yet either, but isn’t it time we started to think about health care differently?